This marked my 11th season of having the pleasure of photographing the beautiful people visiting Ravinia and the concerts they came to experience. While every season has its uniqueness, I must say, this season brought us the most unconventional debuts and thought-provoking shows. 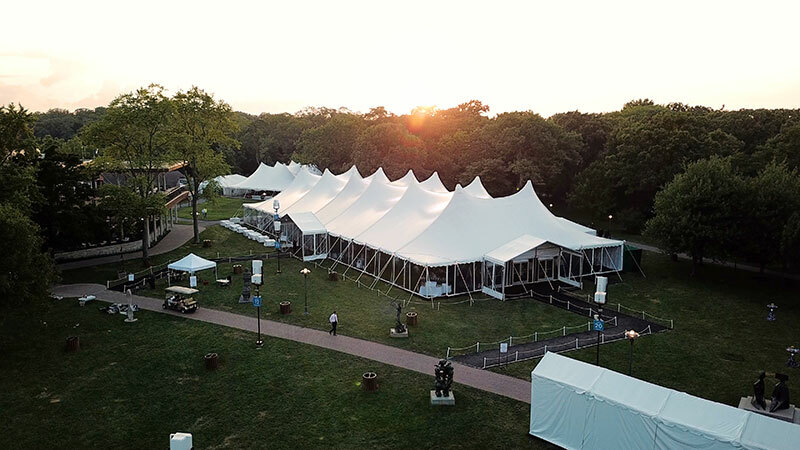 From 50 Cent making his Ravinia debut to Tony Bennett returning for his 39th ahow to an elaborate celebration of Leonard Bernstein to the enchanting Chicago Symphony Orchestra grounding us in musical excellence. Below I have chosen three of my favorite pictures that I feel represent some of my favorite moments from 2018. Thanks to all who joined us and filled Ravinia with love, and I look forward to seeing you all next year! The north lawn is packed with patrons enjoying the Chicago Symphony Orchestra performing the score of E.T. the Extra-Terrestrial while also drinking in the movie in real time. In this photo, I fell in love with the contrast of the warm screen and the light it projected on patrons versus the cool colors of the summer evening sky. Love was in the air—I met many new and familiar faces in the park this season, and honestly I had a hard time choosing who I wanted to feature. This couple had just posed for me in a classic smile-at-the-camera–type pose, and when they thought I was finished, the gentlemen let his guard down and embraced his girlfriend. That was the decisive moment I was looking to capture, and luckily this time I was able to immortalize the beautiful moment. 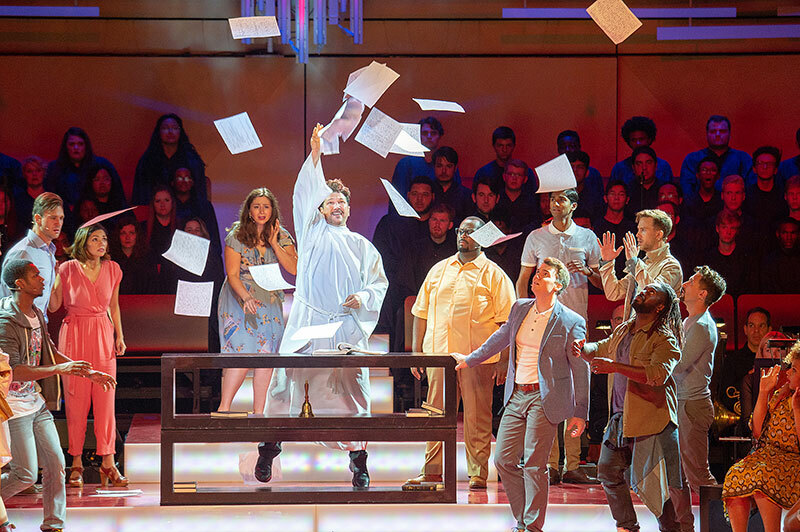 Leonard Bernstein’s Mass—this was one of those productions that we had been preparing forever, or at least it seemed so. To say the scale of this was intense is an understatement. Captured here is the meltdown of Paulo Szot’s character in Bernstein’s Mass. As a photographer, I often say it is not what I put in the frame that matters, but what I leave out that tells the story. In this case, what I left out was only because of the enormous stage setup and not because it changed the story. Not pictured is the Chicago Symphony Orchestra, maestro Marin Alsop, and all the creative staff that worked night and day to make this production astonishing. My sincere respect to all that were involved in the production of Mass, Leonard Bernstein, and everyone who attended. Ravinia Jazz Scholars at Jazz Showcase. Having never been to the Jazz Showcase, it was awesome to shoot with the Jazz Scholars. It provides the best backdrop for the kids. This shot was actually the last photo I took of the evening. Gala Drone Shot. This is my favorite shot because this is the first year we were able to capture the full tent from this perspective. It was a last-minute idea to take the shot, and I think it turned out awesome. 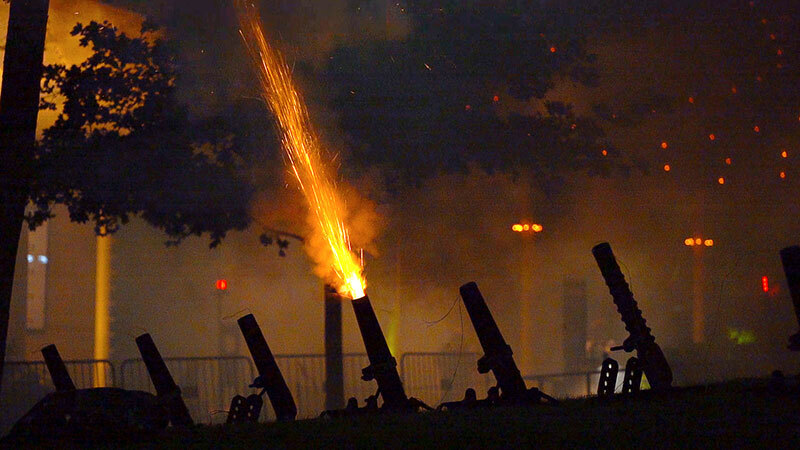 1812 Cannons. Shooting the cannons is usually challenging, but shooting them at night was even more so, just to get the right exposure and to decide what the exposure of the explosion will be. The smoke disappeared pretty quick after this shot, but managing to catch the cannon right in the center was probably the best shot of the night. I worked very closely with Ravinia’s Steans Music Institute this summer. I was able to capture many great moments between the fellows and their coaches. 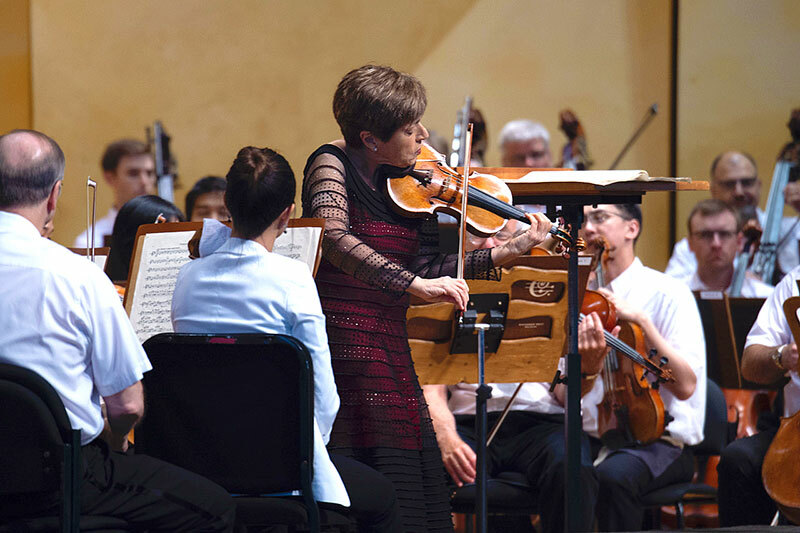 Miriam Fried performed a solo with the Chicago Symphony Orchestra on July 22 with all of her Piano and Strings Program fellows enjoying from the audience. I feel extremely fortunate to have been able to spend my summer here at Ravinia as an intern. I have met so many great people that are extraordinarily talented and simply excellent at what they do here. I have learned so much from everyone around me, and I will forever be grateful for the experience. Enjoying a show in the Pavilion is such a unique experience that is hard to put into words. 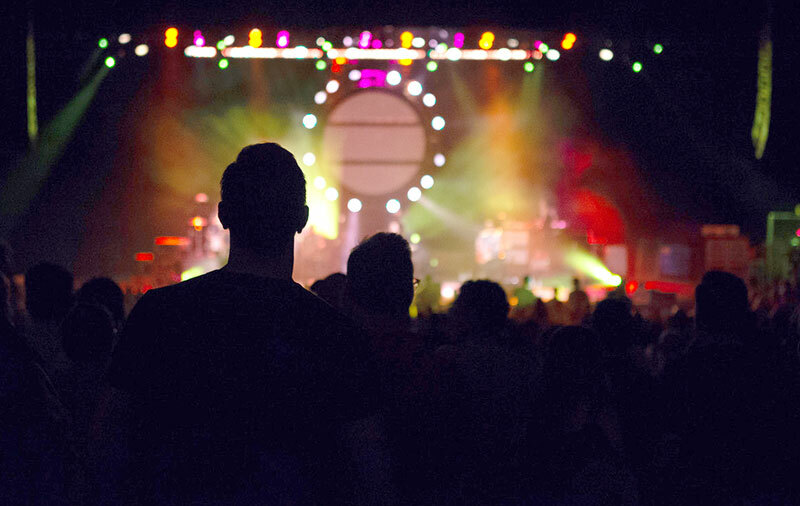 Capturing moments like this gives a better understanding of how special it is to attend a concert at Ravinia. 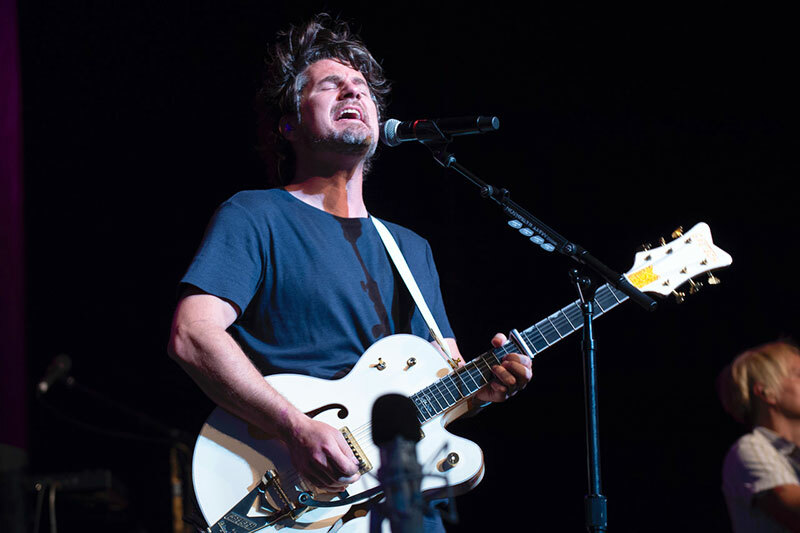 Matt Nathanson brought so much life and energy to the park on September 2. Nathanson connected with the audience the moment he stepped on stage, bringing everyone onto their feet. It was a pleasure capturing moments like this. A playful story unfolds from this seemingly realistic pampering of E.T. the extra-terrestrial. It makes me smile every time—just thinking about a famous alien indulging in the “Ravinia Suite” at the Renaissance North Shore Chicago hotel. Room service? More Reese’s Pieces please. Our new Lawn Bar, with indoor and outdoor seating, glows with colorful appeal. 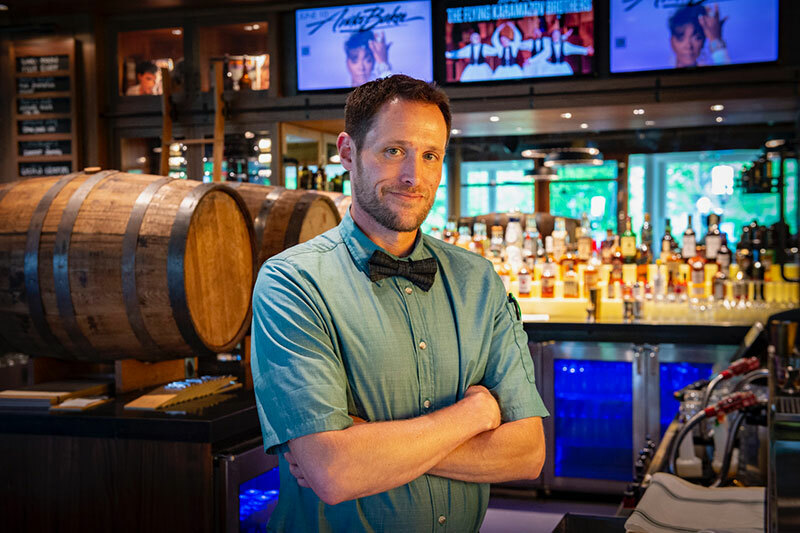 Postured at the helm with a smirk is a mixologist waiting to please. I parallel the variety of colors and textures with what interesting and delicious concoction might be mixed into a glass for me. Further, I like how it feels encouraging to belly-up to one of the bars. A “Russell,” please. (Vodka, ginger ale and a quarter lime.) I am sort of a mule.